My musical quest has led me to the music of a French pop poet, a devout Catholic, an electronic maestro and a proto-hippy. Serge Gainsbourg is best know for the song Je t’aime… moi non plus (I love you… me neither). But don’t let that put you off. Gainsbourg is one of the most important artists in French popular music. His output is diverse and covers numerous styles ranging from jazz, chanson, pop and rock to electronic, disco and funk. This wonderful three-CD box set uncovers his foray into reggae. In 1979 Gainsbourg flew to Jamaica and hooked up with two of reggae’s greatest producers, Sly Dunbar and Robbie Shakespeare. They put together a stellar band that included I Three, Bob Marley’s backing singers. 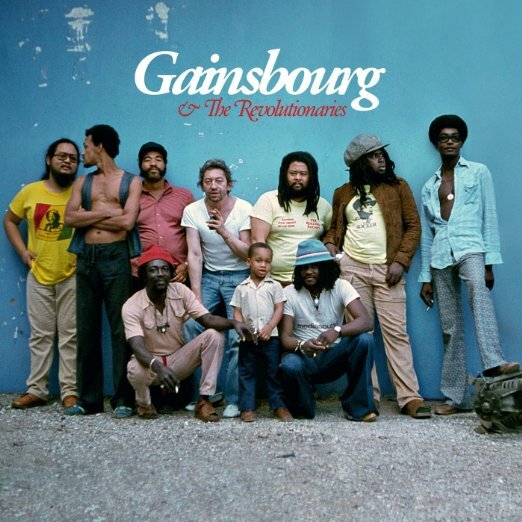 Gainsbourg and Shakespeare decided on the name “the Revolutionaries” for two reasons. Firstly they believed reggae had transformed the world musical landscape with its new rhythms and, secondly, reggae was a revolutionary music linked to the struggle for equality and liberation. The result was two superb albums: Aux Armes Et Caetera and Mauvaises Nouvelles Des Étoiles. This reissue contains both albums, numerous outtakes and a live recording of a concert. The music is fresh and vibrant and the lyrical content oozes with rebellion. The track Strike, is a triumphant call to arms, Bonnie and Clyde a sensual homage to the outlaws, and the songs La Nostalgic Camarade and Drifter are reminiscences of past struggles. But the most inspiring and controversial track was Aux Armes et caetera, a reggae version of the French national anthem La Marseillaise. In this track Gainsbourg was trying to recreate the revolutionary meaning of the song. The French press and the right wing rounded on Gainsbourg. Racism reared its ugly head. French TV and radio stations refused to play the track. One French radio DJ said it was a national disgrace that “black reggae artists” should play the French national anthem. The right-wing newspaper Le Figaro made anti-Semitic comments about Gainsbourg, who was Jewish. He also received death threats from veteran French soldiers of the Algerian War of Independence who also disrupted his shows. Gainsbourg was no saint. He was a complex artist, often drunk and offensive. His music often courted controversy. The Pope denounced the song Je t’aime… moi non plus and in 1975, he released Rock Around the Bunker, an album that mocked Nazism. As a Jewish boy, Gainsbourg was forced to wear the yellow star during the Nazi occupation of France. He and his family lived in hiding during much of this period, avoiding transportation to the death camps. This is a recording of the track Aux Armes et caetera. Cosa Avete Fatto A Solange (What have you done, Solange?) is a beautiful album and if you are familiar with the work of film score maestro Ennio Morricone then you know what to expect. This is the soundrack to Massimo Dallamano’s film of the same name and, like the film itself, it is a dark and haunting, a recording full of menace. The soundtrack combines classical, operatic, religious and easy listening styles. Morricone has written music for more than 500 films and television series. He wrote soundtracks for two of Gillo Pontecorvo’s classic films The Battle of Algiers and Burn and to many of Sergio Leone’s spaghetti westerns. Don’t be fooled by Morricone’s back catalogue: he is not a radical. He is in fact an orthodox Catholic with conservative tastes. But through his music his warmth and humanity shine through. The video below includes the album in full. Do any hip hop heads recognise the opening track? Mobb Deep sampled it on their awesome track Blood Money. This is quite simply Four Tet at his best. A steady house beat is fleshed out by swirling synths and lush samples from the 1983 Bollywood film Souten. This is dance music to sway to. My curve ball this month is the album Eden’s Island by Eden Ahbez. He is best known as the composer of Nature Boy, a beautiful song with a hypnotic, even psychedelic, feel to it. Many people know the song: it was a number 1 hit for eight weeks in 1948 for Nat “King” Cole and has been covered by everyone from Miles Davis, George Benson and John Coltrane to Lady Gaga. But few know Ahbez. Ahbez was a proto-hippy. In the 1940s he lived in California and started playing piano in a raw foods cafe in Los Angeles run by German immigrants who were following the Lebensreform movement – a back-to-nature philosophy popular in Germany and Sweden in the 19th century. Ahbez cut a strange figure in 1940s LA: he had long hair and wore a beard. He only ate raw fruits and vegetables, lived on the streets and could often be found sleeping under the famous Hollywood sign above LA. There is a brilliant photo of a sharp-suited Frank Sinatra sitting next to the hippy Ahbez. In 1961 he recorded Eden’s Island, a jazz/pop/easy listening album full of wonderful verses and tunes. It’s been reissued and is well worth getting. This is Eden singing Nature Boy – the track is not on the album, but if it doesn’t melt your heart I don’t know what will. I always liked J’e t’aime. Will check this out sounds really interesting. But lightweight summer none the less. Hi Roger, you will enjoy the Gainsbourg, it’s not light weight, I read after I wrote the review that Robbie Shakespeare thinks its one of his best recordings. Also lurking in the crates are Dub versions of the albums. I discovered Gainsbourg’s ‘Aux armes et caetera’ some time ago, seeing a film on TV about him. The fuss over the ‘et caetera’ led to “Some years later in 1981, Gainsbourg purchased the original manuscript of “La Marseillaise” at an auction, which was signed by the composer. He then showed critics that his version was, in fact, closer to the original than any other recorded version as the manuscript clearly shows the words “Aux armes et cætera…” for the chorus as author Rouget de l’Isle did not bother writing the full chorus each three times, preferring to shorten it with the word etc..”. This is from Wikipedia but is also what was detailed in the film. Anyway, really like your tracks.